Did you realize that there are many species of frogs and that each of them has unique characteristics? In this kindle book, children and adults will have the opportunity to learn about every aspect of their lives. Olsen defines the word amphibian and traces the life cycle of the frog, the food they eat, their anatomy and skin characteristics, how they use camouflage, how they move and communicate, where they live, and how they can be dangerous to humans. Each description is accompanied by a photograph of that frog. Most people know that frogs develop from eggs laid in the water and later develop lungs and breathe air on land. Are you aware that the age of a frog can be determined by the rings in its bones, and that some frogs live as long as forty years? I learned that not all frogs croak but some chirp, ribbit, whistle, bark or grunt. Their calls have been heard as far as a mile away from their location. The Golden Poison Frog can kill as many as twenty humans or one thousand mice! Olsen mentions toads, but does not go into detail about how they are different from frogs. She also reminds us that we need to keep our waterways clean so that frogs will have a place to lay eggs and prosper. 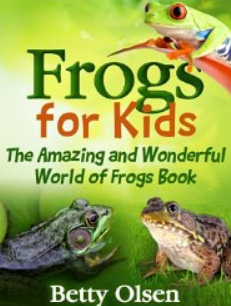 This book is an ideal beginning tool for a child who is interested in frogs or wants to learn basic information for a science project. As such, it is a good resource for elementary school science bookshelves or libraries. I thought the book failed to elaborate on the topics of environment and toads, but perhaps the author plans to expand these subjects at a later date. Overall, the book is well done and the photographs enhance the details. I would recommend reading it on the cloud or in PDF format.